You can find individual software on different screens, such as the Main Menu, the Search Results screen or in the Charts. Once you select this software, you will see additional information on the top screen, while the Touch Screen gives you the opportunity to purchase or download the software. Touch PURCHASE SOFTWARE or DOWNLOAD SOFTWARE to see more information, and then PURCHASE or DOWNLOAD to start downloading the software. If your balance is insufficient, you will need to add funds to your Nintendo 3DS system. For more information about using funds on your Nintendo 3DS system, please click here. 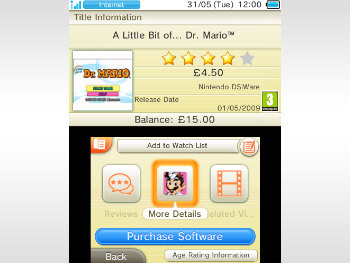 Nintendo 3DS download software and Virtual Console titles will be saved on your SD Card, while Nintendo DSiWare will be saved on the System Memory. For more information about transferring software between the System Memory and an SD Card, please click here. Ensure that the battery on your Nintendo 3DS system is charged up, or plug in the power supply before starting the download. If you delete any software, you can download it again at any time, as long as you do not delete your Nintendo eShop account, and as long as the software is still available from Nintendo eShop. You can do this by tapping on the Menu button within Nintendo eShop, and then on Settings/Other, and then on Titles You’ve Downloaded.